The recent creation of an Office of Counter Terrorism (OCT) to coordinate the overall United Nations (UN) response creates a fitting opportunity to redress the current fractious approach of the many entities within the UN system with counter-terrorism mandates by considering sensible and practical recommendations on how to do so. The recommendations made in this Perspective, if put in place integrally, would bring about a strategically cohesive, holistic and coordinated approach to defeat violent extremism and terrorism throughout the world. In June of this year, UN Secretary-General (SG) António Guterres appointed Vladimir Ivanovich Voronkov of the Russian Federation as the head of the new office at the Under Secretary General (USG) level to provide strategic leadership for the whole UN system to conduct its counter-terrorism efforts and to ensure coordination and coherence of all UN entities in their efforts to support Member States fight terrorism while preserving their individual mandates. Since the overall counter-terrorism structure at the UN is multilayered, overlapping and complex, the new OCT is expected to improve the efficiency and effectiveness of existing counter-terrorism mechanisms, build stronger synergies within existing resources, coordinate respective mandates in a more integrated and unified manner, and underscore counter-terrorism as a core issue of the United Nations. However, the OCT would need to consider additional and much more practical methodologies to achieve real coordination and coherence across the entire UN system beyond the SG’s suggestion for the new USG “to have a close relationship with Security Council bodies and Member States, strengthening existing and developing new partnerships through regular travel and attendance at counter-terrorism-related meetings” . 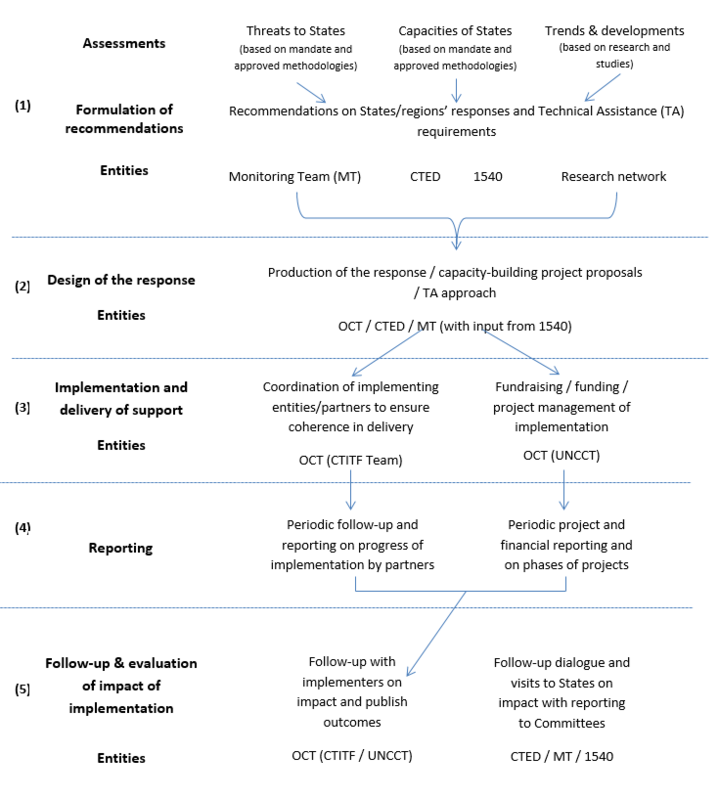 This Perspective discusses a number of steps that the UN system should implement to create a building-block approach to integrate the mandates and outputs of the various UN entities charged with analysis and needs assessments with those of capacity building and resource mobilisation for the benefit of UN Member States. The Security Council (SC) and the General Assembly (GA) have been the two principal UN organs creating institutions with mandates affecting virtually all Member States to address diverse aspects of global terrorism. The Security Council has been seized with the emerging terrorist problem for many years, adopting numerous resolutions that urge States to implement sanctions regimes and counter-terrorism measures in a manner consistent with the rule of law and in conformity with international human rights, refugee and humanitarian law. It had started building counter-terrorism architecture in response to Al-Qaeda’s simultaneous attacks on two American embassies in 1998 by creating the Analytical Support and Sanctions Monitoring Team to report to a Sanctions Committee of the Council in 1999 . After 9/11, the Security Council reacted forcefully and adopted a sweeping and extraordinary resolution, 1373 , to require Member States to take a multitude of steps to protect themselves against terrorist acts and to report to a new Counter-Terrorism Committee. In 2004, it became apparent that independent expert staff was needed to support the work of that Committee, leading to the creation of the Counter-Terrorism Committee Executive Directorate (CTED) in 2004 . Also in that year, the Security Council took an additional step by adopting resolution 1540  to create a Committee of the Council and a Group of Experts to prevent weapons of mass destruction from getting in the hands of non-state actors. These three Security Council bodies were given mandates to help Member States implement the provisions of these resolutions (1267, 1373 and 1540). The Monitoring Team evaluates terrorist threats and assesses compliance with sanctions against named organisations and individuals. CTED assesses the capacities of Member States to respond to terrorist threats, makes recommendations to address shortfalls and monitors regional and global terrorist trends and emerging issues. Finally, the 1540 Committee Group of Experts works with Member States to curb the proliferation of nuclear, chemical, and biological weapons by non-state actors. In September 2006, the General Assembly unanimously adopted Resolution 60/288, the “United Nations Global Counter-Terrorism Strategy” . Intended as an “all-encompassing counter-terrorism instrument,” this resolution called for a wide range of activities (many of which were repeated from Security Council resolutions) as part of a larger strategy to combat terrorism. To ensure a systemic and cohesive UN effort to help Member States implement the Global Strategy, the SG, at the time, established the Counter-Terrorism Implementation Task Force (CTITF), currently composed of 38 entities from within and outside the UN system, which engage in multilateral counter-terrorism efforts and which coalesce around 12 counter-terrorism thematic Working Groups . These Working Groups reflect trends in terrorism as well as UN programmatic responses, and they bring stronger cohesion to international counter-terrorism activities implementing the Strategy. The CTITF and its Working Groups are supported by the CTITF Office, which also supports the United Nations Counter-Terrorism Centre (UNCCT), created in 2011 with extra-budgetary funds from multiple Member State sources to provide additional counter-terrorism programming and capacity-building support to Member States seeking to implement the Global Strategy. In the above resolutions on counter-terrorism, both the Security Council and General Assembly provide many similar provisions to deal with terrorism and work with Member States to implement common counter-terrorism measures. These measures include: dealing effectively with conditions conducive to violent extremism and terrorism; promoting ethnic, cultural and religious tolerance; preventing acts of terrorism; preventing the financing of terrorism or its support in any manner; cooperating in combating terrorism and bringing terrorists to justice; and protecting borders to detect and prevent terrorist incursions and the smuggling of weapons, while respecting human rights and the rule of law. By implementing provisions of relevant Security Council resolutions, Member States also largely implement provisions of the General Assembly’s Global Strategy. However, this dual set of obligations has caused confusion and discordance for many Member States, leading to the call for a senior official to coordinate all UN approaches to fulfilling Security Council and General Assembly resolutions on terrorism. The three counter-terrorism bodies of the Security Council have worked over the years to assess progress made by Member States in implementing relevant resolutions and identified gaps and vulnerabilities in counter-terrorism strategies that Member States adopted or needed to adjust. These three bodies have also independently identified donor countries and other assistance providers who offered financial or expert resources to address those gaps in capabilities. Separately, the CTITF Office also worked with donors to implement the General Assembly’s Global Strategy. The result has been a piece-meal and relatively uncoordinated outcome. As each UN entity pursued its own narrow mandate and objectives, consultation with each other was not effective in developing broad-based approaches to deal with terrorist threats in specific countries or regions. Moreover, these UN bodies have not fully exploited the complementary nature of their mandates and expertise to create a foundational architecture for a “whole-of-UN” strategic response to the persistent threat of international terrorism. Consequently, opportunities have been missed in making significant progress with Member States to resolve the terrorist threats they face. Over the years, Member States and partner organisations have, in various forums and meetings with UN officials, expressed strong concerns about the fragmented UN approach that they regarded as uncoordinated. This point was recently discussed in a brief on CTED by the Global Center on Cooperative Security , as well as by Eric Rosand in an IPI Global Observatory piece . Member States regularly seek UN technical assistance and support to strengthen their capacities and overcome their vulnerabilities to terrorism. Member States are now demanding a UN system that will act as a seamless web of components that complement each other and that are strengthened, not impeded, by separate mandates and reporting lines within the UN system. (See Peter Romaniuk in Multilateral Counter-Terrorism (2010)  and Victor Comras in Flawed Diplomacy: The United Nations and the War on Terrorism (2010)  who chronicle similar fragmentation of approach and lack of focus in supporting Member States’ implementation of resolutions 1267 and 1373). In the same way, we believe that the creation of the OCT will lead to an evolutionary change in the UN response to international terrorism. With Secretary-General Guterres appointing Under Secretary-General Voronkov, the UN counter-terrorism entities will become reinvigorated under a new action-oriented “all of UN” approach closely linked to changing global and regional threats. On 28 September 2017, the USG addressed the Security Council for the first time and outlined “… that there are four important spheres of UN activity that need to be aligned if we are to effectively develop a coherent and well-coordinated ‘All of UN’ framework for our future counter terrorism efforts” . He referred to “four spheres” to achieve that: the Security Council; the General Assembly; the UN Secretariat; and the 38 entities that contribute to UN counter-terrorism efforts. With the creation of the new OCT, the USG’s statement does not specify a concrete methodology to achieve the objective. It is our contention, based on discussions and consultations with numerous stakeholders and our evaluations of the UN counter-terrorism apparatus as senior officers working for many years inside the UN counter-terrorism system, that the UN response should be based on sound assessments of terrorism threats that Member States face. Also needed is a clear-eyed understanding of their capacities to prevent or respond to those threats. This conclusion was also reached by the Global Center in the same brief about CTED . Any UN assistance must provide Member States with effective, concrete, and measurable deliverables to redress identified shortfalls. The proposed OCT could achieve this objective by establishing a unified UN process to identify and respond to threats of terrorism around the world and by pooling the resources of the UN to provide assistance across all four pillars of the UN Global Counter-Terrorism Strategy and relevant Security Council resolutions. As a first step, the three main counter-terrorism bodies of the Security Council that review the threats Member States face and their capacities to address them should share, with the approval of the concerned Member States, their assessments with each other and other relevant UN entities, in order to identify conclusively issues that require urgent attention and areas facing the greatest terrorist threats. Second, the CTITF Team, operating under the guidance of the USG in the new OCT, and in close consultation with the three Security Council assessment bodies and based on their recommendations, should devise strategic action plans and initiatives to address the critical areas of counter-terrorism identified by the assessments of the aforementioned three bodies. These action plans and initiatives should establish the counter-terrorism priorities the UN system should focus its support efforts on, the means and methods to utilize, the tactical intervals that apply, and the UN partners, interlocutors, and assistance providers that would best deliver the required capacity-building assistance. Third, the CTITF Team should aggregate plans and initiatives for different regions of the world to produce a global operational master plan that is transparent and constantly adjusting in line with changing threats, vulnerabilities and accomplishments. This master plan would focus on threats that require high priority consideration for UN responses. Fourth, the CTITF Team should coordinate the activities of the 38 entities that are members of the 12 Thematic CTITF Working Groups more actively to produce rapid, but coordinated, implementation of capacity building and other required assistance to States in response to urgent needs identified in the assessments of the three Security Council bodies. Such coordination would synchronise and integrate the activities of all counter-terrorism entities within and outside of the UN to ensure that shared objectives are met, deployment of financial and staff resources are effective and specific timelines for completion of work are sustained. In this regard, the CTITF Team should play a core role in providing the Working Groups with specific issues to tackle, drawn from the results of the assessments of the three Security Council bodies, as well as the required professional, logistic and administrative support to carry out their activities. The result would establish a set of linked objectives among the Working Groups leading to direct support of Member States in need of UN capacity-building engagement or assistance to implement various provisions of the Global Strategy. Fifth, the new USG should monitor the alignment of the objectives of the UN system writ whole to confront the terrorist threats that continue to emerge or transform. The USG should ensure that the CTITF Team, as the principal body responsible for coordination and cohesion of all UN efforts, continues to enhance current implementation efforts of the Global Strategy and bolster undertakings to evaluate outcomes on the ground, eliminate overlap and duplication, and assure maximisation of overall UN efforts. Sixth, the new USG should also ensure that the CTITF Team and the UNCCT continue to consult closely with the 38 CTITF entities on capacity building project proposals and related funding while also seeking input from Member States on their priority counter-terrorism needs. The UNCCT should continue to represent the best implementation body with initiatives that consistently reflect the aligned priorities established by the OCT and the three Security Council assessment bodies. Eighth, and last, as part of the effort to manage and coordinate the UN system-wide counter-terrorism effort, the new USG should chair a Committee of senior officials from relevant bodies to oversee the development of a strategic framework for the design, implementation and operation of a durable “whole-of-UN” counter-terrorism mechanism. This would break the working silos of the existing UN counter-terrorism bodies, leverage their strengths, and integrate their outcomes so that critical issues would be addressed quickly and effectively. It would also facilitate the aggregation of up-to-date “whole-of-UN” information on current threats, their level of criticality, efforts underway to address them, and the impacts the UN activities are having on Member States. It needs to be underscored that even with the creation of the new OCT office under the leadership of USG Voronkov, all UN counter-terrorism bodies will continue to work within the mandates and existing architecture. But the USG will bring a more efficient and effective management of their interaction, complementarity, impacts on the ground, and expenditure of resources, financial and human. The USG will become the senior face of the United Nations to the media and the world and be the best UN official to seek extra-budgetary financial support from Member States. He would then be in the best position to deploy those resources into a more unified and holistic UN counter-terrorism integrated master plan. Member States that provide extra-budgetary financial assistance have been calling for this step for a number of years. There are no prerequisites to implement this coherent, integrative and comprehensive approach to UN counter-terrorism activities on behalf of Member States. It is essential to demonstrate a strong commitment from the highest office in the UN to undertake and maintain a strategic, holistic and coordinated approach to defeat violent extremism and terrorism throughout the world. That will significantly boost confidence in the UN by current donor states to fund a more efficient and results-oriented process throughout the UN system and will assure recipient Member States that they benefit from coordinated and sustained UN efforts to fight violent extremism and terrorist acts. UNSG Report “Capability of the United Nations system to assist Member States in implementing the United Nations Global Counter-Terrorism Strategy,” (General Assembly A/71/858), paragraph 65. UN Security Council, S/RES/1267, 15 October 1999. UN Security Council, S/RES/1373, 28 September 2001. UN Security Council, S/RES/1535, 26 March 2004. UN Security Council, S/RES/1540, 28 April 2004. UN General Assembly, S/RES/60/288, 8 September 2006. Alistair Millar, “Mission Critical or Mission Creep? Issues to Consider for the Future of the UN Counter-Terrorism Committee and Its Executive Directorate,” Global Centre on Cooperative Security, October 2017, p 5. Eric Rosand, “UN Counterterrorism Reform: Now It’s the Security Council’s Turn”, IPI Global Observatory, 15 September 2017, p 1. Peter Romaniuk, Multilateral Counter-Terrorism: The global politics of cooperation and contestation (Global Institutions) (New York: Routledge, 2010). Victor Comras, Flawed Diplomacy: The United Nations and the War on Terrorism (Washington D.C.: Potomac Books, 2010). UN News Centre, “At Security Council, top counter-terrorism officials stress ‘All of UN’ approach to tackle scourge,” 28 September 2017. Millar, “Mission Critical or Mission Creep?”, 4. See also James Cockayne, Alistair Millar, David Cortright and Peter Romaniuk, “Blue-Sky Thinking 10 Years After 9/11,” Centre on Global Counterterrorism Cooperation, 2012; Naureen Chowdhury Fink et al., “Blue Sky II: Progress and Opportunities in Implementing the UN Global Counter-Terrorism Strategy,” Global Center on Cooperative Security, April 2014; Alistair Millar and Naureen Chowdhury Fink, “Blue Sky III: Taking UN Counterterrorism Efforts in The Next Decade From Plans to Action“, Global Center on Cooperative Security, September 2016. Hassan O. Baage teaches homeland security and terrorism at the University of New Haven, Department of National Security, Henry C. Lee College of Criminal Justice and Forensic Sciences. He served for over eleven years in various capacities, including Chief of Branch, in the Counter-Terrorism Committee Executive Directorate of the United Nations Security Council, following seven years with the World Customs Organization, working on border and cargo security issues, and retirement from the Canadian Federal Service. Dr. Howard Stoffer is Associate Professor, Department of National Security, Henry C. Lee College of Criminal Justice and Forensic Sciences, University of New Haven. He retired after seven years as a Director in the Counter-Terrorism Committee Executive Directorate of the United Nations Security Council and earlier retired as a member of the U.S. Senior Foreign Service, serving twenty-five years with the U.S. Department of State Foreign Service.